Today’s guest post comes from Nicholas Vilelle, who served in AmeriCorps in New Orleans, beginning a little more than one year after Hurricane Katrina. In NOLA, he served as the Operations Manager for a young nonprofit organization, The Phoenix of New Orleans, which was at that time staffed primarily by AmeriCorps volunteers. He is also a Peace Corps alumnus and is the co-founder of Cause. Ever heard of a PhilanthroPub? Have you ever thought about the money you spend on food and drink and where it goes? With so much money being spent, why can’t some of it be taken and used it to create social good? As a 2007 AmeriCorps Alum, I strongly believes in this opportunity and in making the process of getting involved in charitable giving easier and more fun. That is where the idea of a “nonprofit” bar came from. I’m opening a bar and restaurant where 100% of the profits are donated to vetted grassroots organizations. The bar is appropriately named Cause, and he likes to call it a PhilanthroPub. Cause will be donating 100% of its profits to vetted charitable organizations. The bar and restaurant will be selecting grassroots organizations that are doing life changing work in the field, but struggle to get the publicity and funds that they need to assist more people. Cause will not only give all of the profits to the organizations, but also help spread the word to all of its customers about these fantastic organizations. The featured organizations will rotate each quarter, thus allowing the impact to grow. 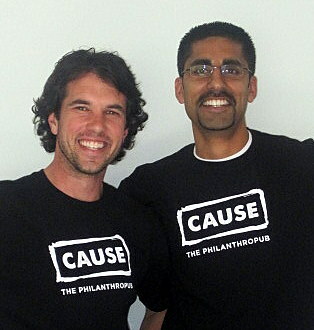 Cause has just secured its location on the trendy U St corridor in Washington DC. The space is two stories and has a capacity of 125 thirsty customers. The Cause menu is currently being assembled by the newly signed on Executive Chef, and it will have a focus on local, seasonal, and sustainable food. The space has a small stage on the second floor, where local artists will be featured. The Cause team is working furiously to get the doors open as soon as possible. They are running a crowdfunding campaign where you can make a contribution to help furnish the bar and restaurant. By keeping their startup costs low, Cause will be able to start distributing profits to the charitable organizations faster. To stay up to date, make sure you like Cause on Facebook and follow them on Twitter. If you’d like to help their Cause, you can donate here on their indiegogo page where they’ve raised over $15,000 towards making Cause happen! ← See You at These NCVS Sessions!